The port is located between Cape of Narlik at the east and Cape of Isikli at the west and is on the eastern side of the city center. Trabzon is within walking distance. Shuttles are also provided. The principal attractions are well outside the city - the Sumela Monastery and the mountains and lake at Uzungöl. Trabzon is located at the cost of Black Sea which has uninterrupted connection with the oceans and situated in a strategic point which is a gateway of Iran Transit Route. Port of Trabzon plays an important role to connect Iran, Iraq, Azerbaijan, Armenia, Uzbekistan and Turkmenistan which were located on the old Silk Road, with European markets with shortest lanes of communications. This connection provides also assurances of cost reduction for all. The castle walls stretch from the coast to the hills in the city center, and are the best-preserved ruins of the region. The center of the old fortified town is Ortahisar, literally Middle Castle, with the upper citadel upstream and Ortahisar Cami and several gates. This mosque, also known as Fatih Cami, was probably a church in the 3rd century and later the main cathedral during the Trapezuntine Empire. Fatih Tower was constructed by Empress Irene in 1340, and used as a meeting-place for Trabzon aristocracy. There is little left of the upper citadel, once the Comnenius palace, but a few crumbling walls. 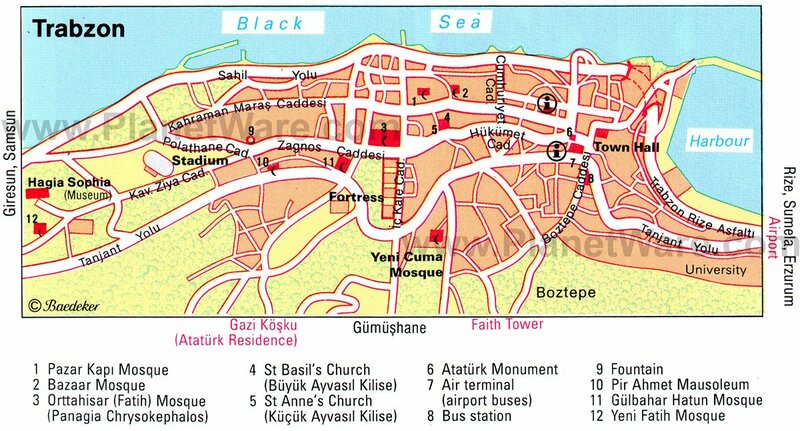 There's not that much to see in Trabzon itself - there's the Aya Sofia Church, which you can reach by a dolmus ride from the center in a few minutes and Ataturk's House/Museum which is in the center itself. SüMela Manastiri (Meryem Ana Manastiri-Maçka): this Greek Orthodox monastery was constructed within a cavern in the middle of a steep slope above dense forests, and lies 45km south of Trabzon. This was the most important of many monasteries built in the area during the Byzantine era and the best preserved, even after it was abandoned in 1923 when the Turkish Republic was created. Several years later one of the monks discovered treasures - including the famous icon said to have been painted by St Luke and responsible for several miracles. Recent restorations have enhanced the quality of the different chapels, some of which contain frescoes dating back to the 9th century. Its setting is within Altindere national park, with thick forests, streams and trout farms, making it a popular excursion especially for locals at weekends. There are few private bus tours from Trabzon, and it is also possible by minibus or shared taxi. Trabzon regional cuisine is traditionally reliant on fish, especially Hamsi (fresh European Anchovies similar to British Sprat or American Smelt). Food in the Trabzon region represents the hearty lifestyle of the Turkish people who live on the shores of this Black Sea city. Traditional handicrafts such as carpets, copper goods, painted ceramics and jewelry are popular buys, along with a good selection of leather goods, sandals and beachwear which can be found in most of the larger resorts. In souvenir shops and stalls, it's always worth trying a spot of haggling. For food shopping, local mini markets provide basic essentials, whilst the supermarkets found near the larger resorts are similar to those we are used to at home. Most resorts have a weekly market selling local produce, crafts and textiles and are well worth a visit. Turkey's currency is the Turkish Lira. Many shops and restaurants in the coastal resorts and big cities accept payment in foreign currency. But if you are planning to travel to other parts of the country, it is advisable to take some Turkish Lira. With a credit or debit card you can withdraw local currency from cash machines which are found in convenient locations in cities, towns and resorts. Internet-cafés or net-cafés are available even in small towns. All of them have have good DSL connections , and price for connection is about more or less 1 YTL/hour. Free wireless connections are available at some hotels and restaurants/cafés, especially in big cities. In tourist and coastal areas, opening hours are quite flexible and during the summer many shops stay open until late in the evening, seven days a week, leaving tourists to browse at their leisure and escape the heat of the day.